When you open a new box of reeds to try them, never play them for more than a few minutes on the first day. During the first five to seven days of a reed's life, avoid playing it for more than ten minutes a day. This allows the reed to become accustomed to wetting and drying gradually and will increase its useful lifespan. When the break-in period is over and the new reed joins your other playing reeds, alternate the reeds you are using each day. Don't play a reed for hours at a time, day after day. It won't last as long or be as consistent as it would if it is allowed to "rest", alternating with other playable reeds. In order to use reeds in this fashion, you must have playable reeds and reeds that are in the process of being broken in. I would suggest that you have on hand a minimum of eight reeds at all times. 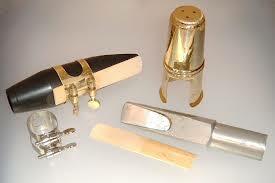 For example, this would give you four playing reeds and four reeds which are being broken in. As the playing reeds are being used up, they are replaced by properly broken reeds. This procedure continues so that you never have to play a performance, rehearsal, or a lesson on a new or unadjusted reed. Reeds last longer and play better when stored in a stable environment. When they are allowed to dry out excessively or soak up too much moisture, they warp. Don't confuse warping with a wrinkled tip which occurs when the reed is first wet. This wrinkling is an indication that it has been allowed to dry out too much. It probably is warped if this happens, but it is mainly useful as a general indication of lack of sufficient moisture in the reed during storage. A simple solution to maintaining moisture in reeds is to keep reed cases/holders in a re-sealable plastic bag or small food storage box. It is important to dry the reeds off before putting them away as they will warp in a concave manner if too wet and, of course, mildew and mould could be a problem also. You can help maintain a smooth, hard surface on the back of a reed by rubbing it down on paper after each use. Also, rubbing the top surface of the reed with the finger or a smooth, round object is a normal part of the breaking-in process. This helps seal the open tubes at the surface of the reed and helps form a homogenous vibrating unit. Do this last procedure on a piece of glass or any flat, smooth surface.